Multimedia is a reality of today’s media world. It makes our life more exciting and media messages more attractive and memorable. There is no need for expensive technical equipment. With a smartphone and a few mobile applications, we can get our creative juices flowing. The aim of this paper is to identify and explore existing mobile applications suitable for implementation into Media Studies, including teaching methods and activities helping to meet learning goals. Media Studies is an intellectually challenging contemporary study programme. Its graduates influence our socio-cultural reality to a large extent. Therefore partial innovations of its syllabus in harmony with the latest trends can significantly contribute to a higher quality of media outputs at all levels. The author carried out detailed research into a number of mobile applications, with regards to their strengths and potential weaknesses. Not only awareness of their existence but, mainly, the possibility of their active use in seminars is the goal of this paper. Mobile applications examined in this study evenly cover areas such as news, story building, photo editing, audio/video editing, and, last but not least, blogging. The author is fully convinced that the specifics of smartphone-mediated interactions versus face-to-face learning require further research that will shed light on these issues as the picture is still incomplete. Blogging, learning goals, media studies, mobile application, multimedia, socio-cultural reality, story building, video/audio editing. “The everyday use of digital technology clearly reveals the dominant role of emotions in our time, and how these – by using such technologies – influence the way in which the identity of their users is configured and expressed.” Since there are two sides to every coin, the consequences of mutual interaction between people and technology may be positive or negative, emotional or rational. Consequently, insightful monitoring is pertinent and any potential warning signals should not be neglected. The graduates of Media Studies – disregarding their actual roles, ranging from media experts, (data) journalists or spokespersons to directors of photography or movie directors, just to name a few, are those who undoubtedly shape the world around us which, in turn, shapes all of us. Similarly to the jobs of marketing experts, media-related jobs are becoming rather technological, too. Consequently, there is a new responsibility lying on the shoulders of educators. It consists in the necessity to prepare Media Studies’ students for their future jobs by enhancing their technical and technological skills hand-in-hand with theoretical and conceptual frameworks underpinning their knowledge. As the world ‘goes mobile’, so university educators should challenge the status quo and make the necessary changes to the syllabuses of tertiary instruction. Within Media Studies, they should follow current trends and offer students opportunities to master new important media skills. The author is fully aware of the lack of a large number of scientific studies and research projects relevant to the topic. However, reality is inexorable and the need to modify and complement the Media Studies’ curriculum allows no delay. Acquiring new, mostly technological skills will not only help to bridge theory and practice in a way that doesn’t require massive investments, but easily accessible mobile applications will make the transition between formal schooling and experiential learning much easier. In the course of their studies, students engaged in user-friendly designed mobile apps’ environment while creating different kinds of interesting media outputs are, again, a step closer to real world practice. Simultaneously, enhanced employability is just a logical consequence of the efforts put into learning. The role of higher education teachers and administrators is critically important as they are facing non-stop paradigm change, as it was already highlighted at the Bucharest Communiqué in 2012: “Today’s graduates need to combine transversal, multidisciplinary and innovation skills and competences with up-to-date subject-specific knowledge so as to be able to contribute to the wider needs of society and the labour market.” This statement is still valid. Furthermore, the OECD has prioritised skills on its agenda and, so, has developed a Skills Strategy. According to the OECD, “Developing relevant skills: Ensuring that the supply of skills is sufficient in both quantity and quality to meet current and emerging needs is a central goal of skills policies. Supply can be ensured by developing the right mix of skills through education and training, and influencing the flow of skills by attracting and retaining talent. Supply is not only responsive to demand, it can also have an important influence on demand.” Along with the authors of the above-mentioned Skills Strategy, the author of this paper believes that efficient policies can be developed to transform better skills into better jobs and economic growth. There is no doubt that the smartphone is not only used by more and more people with higher and higher frequency – globally, adults check their mobile devices on average once every six minutes – but also for more and more activities. A wider scope of activities goes hand-in-hand with technological features and applications embodied in today’s smartphones. These activities are related to informational, educational, entertainment and/or practical needs. Focusing on the needs of Media Studies, latest statistics prove the ever-increasing popularity of photographs and videos. Not only YouTube and Facebook but also social media sites like Instagram and Pinterest largely benefit from this trend. 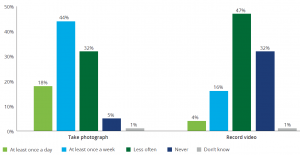 In view of these numbers, it is obvious that smartphones caused a photography boom – not only in terms of the numbers of photographs but also the frequency of taking photographs and shooting videos are quite significant. Chart 2 below brings some recent data compiled by Deloitte Global. Question: Please state how often you do each of these (take photographs/record video). The increasing popularity of multimedia formats lies in the foundation of another emerging trend, i.e. multimedia news. Traditional inverted pyramid writing style is embodied into multimedia formats among which the video format takes the lead. Watching a short video with the latest news is undoubtedly much more engaging than having to read an article. The video format makes the story interesting, memorable and, last but not least, easily sharable. Before the author focuses her attention on the examination of mobile apps carefully chosen for Media Studies’ programmes, a few facts dealing with mobile learning are worth mentioning. Already in 2005, as a result of their research, in their article Sharples et al. predicted that mobile learning would represent a challenge to formal schooling. “This [i.e. Mobile learning] can be seen as a challenge to formal schooling, to the autonomy of the classroom and to the curriculum as the means to impart the knowledge and skills needed for adulthood. But it can also be an opportunity to bridge the gulf between formal and experiential learning, opening new possibilities for personal fulfilment and lifelong learning.” Today, in 2018, we can experience the realisation of their prediction. One of the most revealing pieces of evidence of this can be seen in Massive Open Online Courses (MOOCs) delivered predominantly in the form of mobile apps. In spite of the fact that many enrollees don’t finish their course, in absolute numbers the success is huge. There are over 2.1 million course completions, as of April 2015, among courses offered by Coursera, which is only one of the MOOC providers. a primary goal of improving their current job (or finding a new one). Specific career benefits are mentioned in Chart 3. Source: Who’s Benefiting from MOOCs, and Why. [online]. [2018-02- 25]. Apart from career benefits, also educational benefits of MOOCs identified the Coursera survey findings are quite significant and useful for tertiary educators and managers – see Chart 4. Source: Who’s Benefiting from MOOCs, and Why. [online]. [2018-02-25]. With reference to the above chart, e.g. a mobile course as a helping hand in the decision-making process of what to study, or help in identifying specific universities to which to apply – these are benefits of extraordinary value for any type of tertiary level educational institution. Not only MOOCs but also any other educational courses delivered in the format of mobile apps and, above all, open access to these mobile courses are changing the educational landscape. It is a completely new learning experience which undoubtedly proves beneficial to learners. Simultaneously, it is worth incorporating into the syllabuses of different university study programmes. There is one more important fact to consider as far as formal and informal learning is concerned. The author of this paper is fully convinced that it is much more far-sighted to take a pro-active approach and convert the MOOCs and other high-quality informal learning resources into allies than to have to compete with them for students’ favour in the not-too-distant future. In order to gain fresh and relevant data on the situation with mobile learning and its perception at Czech universities, the author replicated a recent global survey on “User Perception of Mobile Learning Effectiveness”. (User Perception of Mobile Learning Effectiveness – A Survey Report, 2017) The scale of the survey is minor (21 respondents). The data was collected from March 6 to March 14, 2018. The respondents were exclusively university teachers from several universities (The University of Finance and Administration, The Czech University of Life Sciences Prague, The University of Economics, The University of West Bohemia, and The University of Pardubice). The following table compares the most significant findings from both the Czech and global research projects. 1 What is the definition of mobile learning? 2 How can mobile learning help you? 3 How organizations can benefit from mobile learning? 4 How is mobile learning beneficial to the learner? 6 What are the main obstacles to adopt mobile learning? Global survey – User Perception of Mobile Learning Effectiveness – A Survey Report. a relatively short period. Nevertheless, we can already spot a few interesting moments: 75% of the Czech respondents believe that mobile learning can improve their knowledge (globally 79%), however only 30% of them believe that mobile learning can be useful in acquiring new skills (skills = globally 79%). Peer-to-peer/social learning allowing collaboration among learners was denoted by a mere 37% of the Czech respondents (globally 71%). The main obstacle to adopt mobile learning consisting in psychological resistance of stakeholders was chosen by 65% of Czech respondents (it is also perceived as a big problem globally – 68%). Internet bandwidth issues are not felt to be an obstable by many respondents in the Czech Republic, i.e. only 35% in comparison with the global number reaching 74%. Worldwide statistics showed respondents were more critical to the possibility of teaching/delivering any subject effectively (the Czechs were more optimistic – 56%). However, given the small sample size, caution must be used when interpreting the results. Rapidly changing world and disruptive technological innovations have changed the world of journalism as a whole and, specifically, the work of journalists in an unprecedented way: audio, video, moving charts and even elements of augmented reality – all this is a part of readers’/viewers’ expectations today. Journalism, as well as many other disciplines, is becoming rather technological. The good news is that there are numerous sophisticated mobile applications which fully fit into the typical lifestyle of journalists and help them fulfil their daily duties. It is the eleventh hour to start the process of implementation of these new IT skills into Media Studies. They predominantly consist in mastering various functions/features of carefully selected mobile apps which make the work of journalists not only easier and efficient and also more enjoyable. The process of seamless integration of new mobile apps into the classical syllabus of Media Studies is a new challenge for university educators. The author of this paper believes that ‘the change’ should start already at the level of university education. It is the top priority of universities to contribute to it by their research embodied in an attempted merger of the ‘legacy operating models’ and the ‘innovative operating models’ within the tertiary study programme of Media Studies. Following a careful selection process, the author of this paper divided the mobile applications suitable for Media Studies into five groups: (1) news apps, (2) photo/image editing apps, (3) video editing apps, (4) audio editing apps, and (5) blogging apps. A lesson plan demonstrating possible use of these apps in Media Studies’ seminars can be considered as added value of this treatise and it can help educators to take their first steps in this direction with greater confidence. First, it is important to solve the problem of how to stay informed on 24/7 basis and be notified on important issues at the moment of their happening. The second step is to stay informed on the topic of a journalist’s preference as it is currently common practice that journalists tend to specialize in a particular area of interest or, perhaps, industries. The selections of individual apps mentioned further on in the text is purely the author’s decision and the author claims that she has no business relations to any of the apps’ developers and/or providers/sellers. The apps described in this chapter are mostly for iOS. However, very often, the same or a similar app also exists for the Android operating system. BBC News App (incoming multimedia news) is the basic mobile app to reside in a smartphone of Media Studies’ students. There are a few reasons for that: it is a source of information which is reputable and reliable; all important news from all over the world can be found there as well as interesting stories. International news is updated 24 hours a day. There is a section of ‘One-minute World News’ which is the latest news summary from BBC World News and is intended for busy people. The video section brings/archives live stories usually in the length from 30 seconds to 2 or 3 minutes sharing the atmosphere of a particular event. BBC News App – section Live offers online mobile broadcasting of international news, analyses and features from the BBC World Service with the highest levels of expertise and insight from the global network of correspondents. The BBC News App is a smart tool enabling its user to organize the news of interest in the section ‘My topics’ for easy access. Push notifications for breaking news (incl. the alert sound option) or text size setting are practical features which are welcome by the BBC News App’s users. BBC iPlayer Radio (incoming audio news) is an app allowing free access to several digital radio stations with the possibility of downloading programmes of your choice to your device and listen to them offline. Radio programmes and different podcasts represent a great way of listening to digital content while doing manual work or while e.g. commuting to work. ČTK mobile application is the very first Czech Infobank provided by Czech News Agency (ČTK). The app offers a comfortable access to the selection from the currently updated ČTK news service. According to the provider, it covers about 12% of the total amount of news. Messages contain photos which can be shared via email, Facebook and Twitter. It also allows you to read messages in offline mode, too. The ČT24 mobile app with a 24/7 access to news either in an audio or a video format is an excellent companion for people ‘on the go’. Well-structured content in several categories, streaming audio/video news, download of articles to one’s own device, landscape mode for video watching, bookmarking and sharing options and other features make this app very popular. Having access to the most prestige news apps will serve students as an inspiration with numerous examples of news coverage at a professional level. Educators are expected to help students understand various formats of news coverage and get acquainted with professional level reporting skills. Learning goals – Skills/techniques: creativity, critical thinking, project work, critical analysis, communication, collaboration. “A picture tells a thousand words.” is a famous phrase adopted by many. Only Dan Pink, author of 6 New York Times bestselling books, in his famous TED talk challenged this phrase by saying: “If a picture is worth a thousand words, a metaphor is worth a thousand pictures”. It is no secret that, for journalists, the importance of both is beyond all doubt. Owing to the fact that there are literally hundreds of photo/image editing apps, it is important to concentrate on the practice of journalists. What do they really need? Let’s start with the frequented need to blur the photo background (for any reason) and blur the face (for legal/security reasons). There are four apps to choose from. Blur Photo Effect Background apps offers high resolution editing with zoom so that you can see the finest details, soft and hard brushes, 13 filter effects. Also, you can create your own blurred wallpapers using your own photos. The app has the feature of rotating image without having to rotate the device and allows export in 14 different ratio sizes. Current rating from users reaches 4,5. Blur Photo Background for iOS helps to blur the background of any picture of yours with just few taps. You can blur unwanted objects, faces or, indeed, anything. 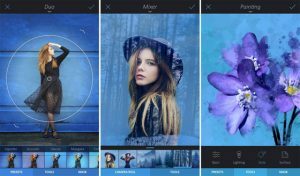 There are many apps that help you to add textures and various lighting effects. Lens distortions can enhance your photos with various light effects, sun flares, and fog. Adding these elements is intuitive. The basic version comes with a basic collection of effects (free of charge). Additional effects, e.g. 230 additional filters, are definitely worth buying. TouchRetouch is another app for removing unwanted blemishes and objects from images. It offers also a clone tool to duplicate objects. In order to conclude this section, there are professional photo editors available, e.g. Snapseed developed by Google, Inc. or Camera+ by LateNiteSoft that will solve majority of your photo editing requirements and special wishes. 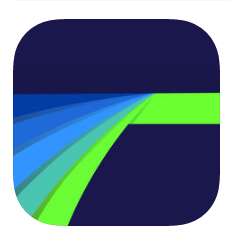 If you need to correct horizontal and vertical perspective distortion, use the SKRWT app by Mathaeus Jagielski; and finally, if you long for some creative and artistic tools, then the app Englight by Lightrics Ltd. will definitely help you. Among hundreds of photo editing applications, this was just a handful of the best ones. Everyone can master these apps quickly and easily. It will be the university teachers of Media Studies who may encourage students to learn how to use them. As a rule, students are very creative and they will soon use this type of apps to their full potential. Learning goals – Skills/techniques: specific photo editing skills: blurring photo background, blurring face, photo lightning effects, removing unwanted objects, perspective distortion, and artistic touch. 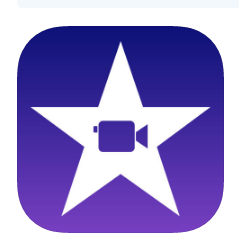 A very popular mobile app for iPhone users for video editing is iMovie developed by Apple. It is a free-of-charge, advertising-free mobile app to create beautiful movies. There are 14 templates with stunning graphics, built-in music and sound effects. There is a handy feature: you can easily transfer projects between different Apple devices using AirDrop or iCloud Drive. It means you can start your video editing on your iPhone and finish it later at home using your iMac. Numerous options for sharing a finished video are available, too. A sophisticated mobile app for video editing for mobile journalists is Luma Fusion by Luma Touch LLC. It is a powerful multi-track professional video editor and a tool for numerous amazing video effects for compelling video stories. There are video tutorials and forums for enthusiasts and professionals. The price of this app is 499,– Czech Crowns. Learning goals – Skills/techniques: specific video editing skills: video scripting, video editing, captions, subtitles, soundtrack, sharing video projects. A mic and a voice recorder have been used by journalists for decades to record precious audio moments. However, any audio recording needs editing and there are few apps which can offer a solution easily and quickly. One of the most frequently used among them is Hokusai Audio Editor by Wooji Juice Ltd. Hokusai is a multitrack audio editor. It records or imports a track and offers a full range of features one can imagine for audio editing, including filters and special effects. The sound is natural and clean. It is in English and it is free of charge. Lexis Audio Editor is an analogy for Android operating system and it is a big help to journalists who look for a simple-to-use audio editing app. Among other features, this app will allow you to record your voice and insert it to the already existing audio file. Learning goals – Skills/techniques: specific audio editing skills: audio interviewing, scripts, editing and mixing tracks, sound filters, special effects, sharing audio projects. BlogTouch is the most powerful WordPress mobile editor. It is very popular and comfortable to use. Tumblr – an easy to use and enjoyable blogging platform. With all of these platforms you will be able to create a new post, edit the already existing post and upload media. Learning goals – Skills/techniques: working in a mobile blogging platform, creating / editing / uploading new posts, dealing with commentaries. Subchapter 1.5 identified five areas of tasks and activities which are typical for the practice of contemporary multimedia journalism where news content is disseminated via multiple media platforms. The job of a multimedia journalist has become rather technological. It is not exceptional that today’s journalists are expected to be familiar with skills encompassing photo/video/audio editing, and blogging at – at least – a rudimentary level. a cautious approach to the sensitive combination of the scientific content of Media Studies and digital communication technologies used in the media world. Teacher training with focus on new media competencies is a precondition for success. To help teachers be more confident in their new roles, the author of this paper presents a sample lesson plan demonstrating a possible use of multiple apps. Table 2 Lesson Plan: Should teachers carry a gun to protect students? Should teachers carry a gun to protect students? Objective: Students will demonstrate the ability to critically evaluate online news and use mobile applications for photo/video/audio editing and blogging while working on a real-life assignment. controversial topic is covered in different news apps. Then the students will compare the findings of their research and make a list of valuable ideas and data. a blog post to be uploaded onto the University Students’ and Teachers’ blog. Topic-relevant visuals carefully selected and edited with the help of various mobile apps will complement each of the formats. 4 Video invitation to an open lecture given by an expert on security issues on the premises of the University. Make use of students’ knowledge of a film trailer features (making the audience curious by revealing just some information but not too much) and let them use the mobile app iMovie, including appropriate background music and texts. 5 A short interview with the Vice-Dean (or another representative of the University’s management) on measures taken/to be taken by the University with the aim to ensure students/parents/local community that everything is under control. The interview will be recorded using a smartphone app and broadcasted on the local radio station. Then it will be uploaded as streaming audio on the students’ section of the University webpage. Note: If more groups work on the project, a students’ contest can be organized. A gala evening can be held to officially announce the winners. The aim of this paper was to identify and explore existing mobile applications suitable for implementation into Media Studies programmes, including teaching methods and activities helping to meet specific learning goals. Based on literature review and equipped with the findings of an extensive research in specific purpose mobile applications, both in Apple and Google Play app stores, the author challenged the status quo of Media Studies’ syllabuses and suggested their modification – and complementation with the aim of bringing the study programme closer to the multimedia journalists’ current practice requirements. Strict selection criteria were set focusing mainly on the functions critically needed in a multimedia journalist profession. In total, eighteen smart mobile applications in five categories were identified and analysed from the viewpoint of their benefits for Media Studies’ students. However, pure awareness of the existence of mobile applications with functions pertinent to journalists’ and digital communication experts’ daily routine is a long way short of reaching the stipulated specific learning goals. In order to gain fresh and relevant data on the situation with mobile learning at Czech universities, the author replicated a recent global research on user perception of mobile learning effectiveness. The main objective was to establish the facts on mobile learning and its perception in tertiary education in the Czech Republic. Therefore, respondents were recruited exclusively among university teachers. The results were presented in a well-arranged manner in the format of a table comparing the most important findings from both the Czech survey and the global research. The author of this paper is fully convinced that the specifics of smartphone-mediated interactions versus face-to-face learning still require further research that will shed light on these issues as both the face-to-face and digital realms are predestined to merge more and more as the learning technologies evolve. A further discussion of deeper integration of mobile technologies into instruction at university level falls outside the scope of this paper. However, disruptive changes may occur suddenly in the world of tertiary education. Therefore, it is much better to adopt a pro-active approach immediately. Strategic Questions the Media Industry’s Future Depends On. 2015. [online]. [2018-03-05]. Available at: <https://hbr.org/2015/10/3-strategic-questions-the-media-industrys-future-depends-on?autocomplete=true>. Better Skills, Better Jobs, Better Lives: A Strategic Approach to Skills Policies. [online]. Compilation Daniel Pink: A Whole New mind – YouTube (Full Video.) [online]. [2018-02-25]. Available at: < https://www.youtube.com/watch?v=RFL30u5BdLc&t=92s>. Communiqué of the Conference of European Ministers Responsible for Higher Education: Bucharest, 26-27 April 2012. [online]. [2018-02-25]. Available at: <http://media.ehea.info/file/2012_Bucharest/67/3/Bucharest_Communique_2012_610673.pdf>. Coursera Survey Data in Who’s Benefiting from MOOCs, and Why. [online]. [2018-02-25]. Available at: <https://hbr.org/2015/09/whos-benefiting-from-moocs-and-why>. SERRANO-PUCHE, J.: Emotions and Digital Technologies: Mapping the Field of Research in Media Studies. [online]. [2018-02-25]. Available at: <https://www.researchgate.net/publication/309668268_Emotions_and_Digital_Technologies_Mapping_the_Field_of_Research_in_Media_Studies/overview>. SHARPLES, M., Taylor, J., Vavoula, G.: A theory of learning for the mobile age. [online]. [2018-03-03] Available at: <http://link.springer.com/10.1007/978-3-531-92133-4_6>. 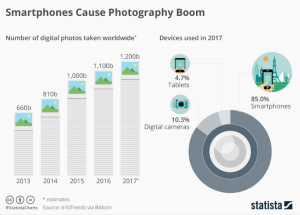 Smartphones Cause Photography Boom | Statista. [online]. [2018-02-27]. Available at: <https://www.statista.com/chart/10913/number-of-photos-taken-worldwide/>. TMT Predictions 2018: Overview | Technology, Media, and Telecommunications. [online]. User Perception of Mobile Learning Effectiveness – A Survey Report. [online]. [2018-03-13]. Available at: <https://www.commlabindia.com/resources/survey-report/user-perceptions-of-mobile-learning.php>. Who’s Benefiting from MOOCs, and Why. [online]. [2018-03-04]. Available at: <https://hbr.org/2015/09/whos-benefiting-from-moocs-and-why>. WILDEN, S.: Mobile Learning into the Classroom. Oxford : Oxford University Press, 2017. WILDEN, S.: Mobile Learning into the Classroom. Oxford : Oxford University Press, 2017, p. 14. WILDEN, S.: Mobile Learning into the Classroom. Oxford : Oxford University Press, 2017. p. 14. SHARPLES, M., Taylor, J.,Vavoula, G.: A theory of learning for the mobile age. [online]. [2018-03-03] Available at: <http://link.springer.com/10.1007/978-3-531-92133-4_6>. 3 Strategic Questions the Media Industry’s Future Depends On. 2015. [online]. [2018-03-05]. Available at: <https://hbr.org/2015/10/3-strategic-questions-the-media-industrys-future-depends-on?autocomplete=true>.